-United States (2): There’s no doubting the legacy the United States have in women’s football. While the men struggle to make it past the Round of 16, the U.S. excel like no other country having won two World Cups–they’ve never finished worse than third at a Women’s World Cup– and Olympic gold in four of the five Games women’s soccer has been contested. They’ve churned out legends of their sport in the past like Kristine Lilly, Mia Hamm, Julie Foudy and Brandi Chastain and they continue to churn out current greats like Christie Rampone, Abby Wambach, Megan Rapinoe and Hope Solo. The U.S. may excel like no other country but they’re not invincible. 1999 is the last year the women have won a World Cup. Even play this past year has shown their imperfections as they’ve lost to Brazil and France and tied against China and Canada. They’re not even guaranteed to finish top of their group as they lost to Sweden in their last meeting with them March of last year. Remember that they lost to Sweden in the Group Stage of Germany 2011. Even though Coach Jillian Ellis is hoping to lead them to their first World Cup in sixteen years, she will acknowledge this will be a tough group. If they’re all together here in Canada, they can do it. They do have what it takes. -Australia (10): You know how the men are called the ‘Socceroos?’ The women are called the ‘Matildas!’ Australia’s women have competed in all but the first World Cup. They had very good success under the OFC as they competed in two Olympics and even earned a 5th place finish in 2004. Switching from the OFC to the AFC have helped them in terms of World Cup play as they were able to qualify for the quarterfinals for the first time back in 2007 and win the Asian Cup in 2010. 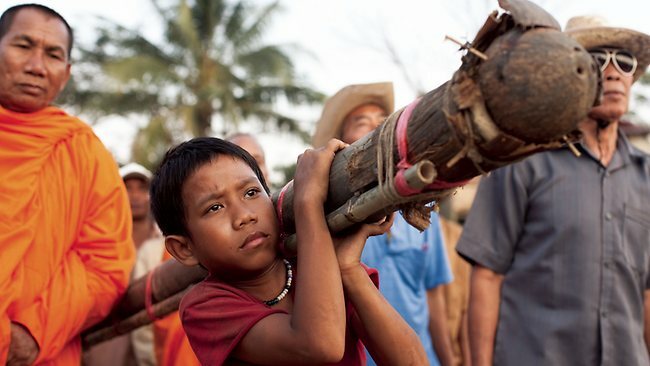 Australia is looking for its first big breakthrough on the world stage. However it will have to come with a fight. They’ve been playing very well against Asian teams but have struggled against teams from outside the AFC such as a 3-0 loss to England back in March. Their group chances also look questionable as they’ve lost their most recent meetings against Sweden and the U.S. and they’ve never played Nigeria before. Whatever the situation, this World Cup could be either new glory for Australia or another learning experience for the future. -Sweden (5): If there’s one team that can prevent the U.S. from finishing atop Group D, it’s Sweden. They beat the U.S. in their last meeting. They also have a reputation of their own to match. Sure, their best Olympic finish is fourth and sure, Germany has hoarded all but one of the Women’s Euros. However they have finished in the Top 3 at three World Cups including third in 2011 and they’ve had many second and third place finishes at the Women’s Euro. They’ve had a good play record since the least World Cup but it has been imperfect. This year they’ve had wins against Germany, China and Norway but they’ve also had losses to Germany, Brazil and Switzerland. Whatever the situation, Canada will be another proving point for them. They could just emerge the winners if they play right each time. -Nigeria (33): Nigeria is one of only seven teams that have competed at ever Women’s World Cup. Clinching the African berth is a cinch for them. Just as the men have possibly the most illustrious success among African football teams, the women are consistently tops of Africa too. They’ve won the CAF Women’s Championship all but twice. They’ve even made the quarterfinals of both a World Cup and an Olympic Games once before. However Nigeria has the difficulty of being in the toughest group. Yes, they have a good reputation but this is a tight group and they know they will have to be very tough against the U.S. and Sweden because they’ve beaten Nigeria very often in the past. One advantage is that they’ve never played Australia so that game can be a proving point for them. Whatever happens in Canada, I’m sure it will be a benefit to the Nigerian team either as a plus to their reputation or as an opportunity to learn more. MY PREDICTION: This is the hardest group to decide all the places. First and second will be a toughie. I’ll take a risk and predict Sweden to finish first and the U.S. to finish second. I expect third to go to Nigeria. Predicting third was a toughie too. Talk about name changes. The stadium was first named Frank Clair Stadium, then chanced to TD Place Stadium and will be known as Lansdowne Stadium due to FIFA’s orders. The actual playing field dates back to the 1870’s. The first event stands were added in 1908. Lansdowne Park has gone through numerous ramps and revamps over time. It had played host to Ottawa’s CFL teams and college football teams as well as many concerts. However it wasn’t until September 2007 when the lower-south side was showing cracks in the concrete that it was clear a new stadium was needed. Unfortunately it could not be done until there were plans to return a CFL team to Ottawa; Ottawa lost their CFL team in 2005. An agreement was reached in 2008 to have a new CFL team for Ottawa once a new stadium was created. The ‘Design Lansdowne’ program was launched to construct a new stadium over Lansdowne Park. 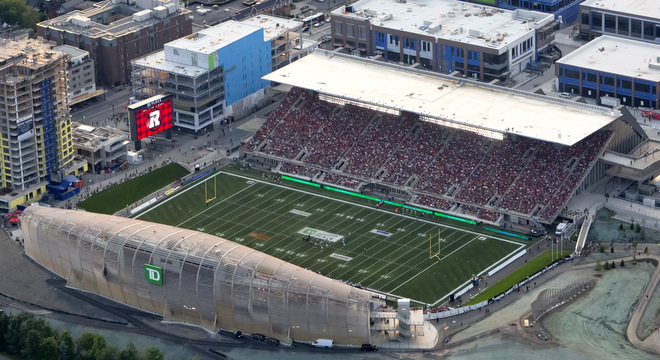 By July 2014, the stadium was completed and Ottawa was ready to welcome their new CFL team, the RedBlacks, in July. The new stadium is also home to Ottawa’s NASL team Ottawa Fury. We see it every men’s World Cup. 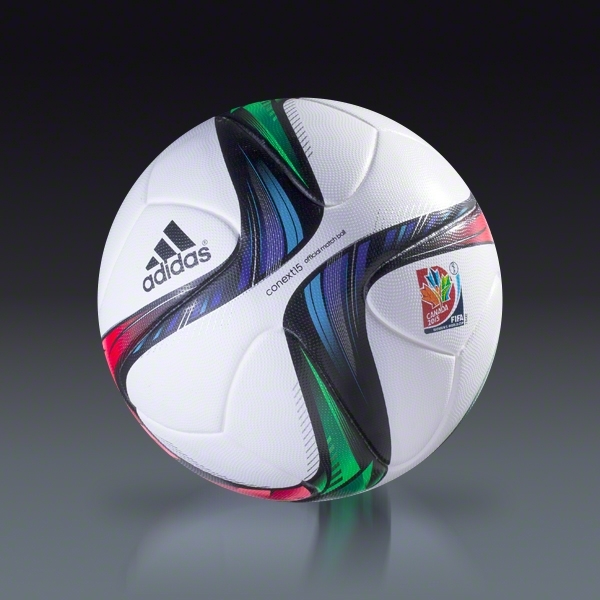 Adidas doesn’t just simply launch a ball specific to the World Cup for the sake of a nice design. It does so with the hopes of adding a new technological innovation to the football. You don’t hear of the football for the Women’s World Cup adding an innovation to the football. However it will be the case for the Conext15. The Conext15 features a new design inspired by the three elements of nature: earth, wind and fire. The flowing green, red and blue design will reflect the perfect balance of the three natural forces. It will include many elements from the Brazuca, the ball from the 2014 World Cup, but will have an innovation of its own: designed for never-before-seen power, swerve and control. Its structural innovation is a unique symmetry of six identical panels alongside a different surface structure that provides improved grip, touch, stability and aerodynamics on the pitch. Guaranteed to be more player-friendly than the Jabulani of 2010, that’s for sure. And there you go. My review of Group D and many more WWC bonuses. Just ten days to go and two more groups to review. The funny thing about the World Cup group draws is its unpredictability. They try to make things easier by designating seeded teams from all the others to give better parity only to end up with a crazy combination. Group B has a combination crazy enough to have the very first match a rematch of the exact World Cup final from 2010! Also just as surprising is that Group B has four teams that are very talented but it’s not enough to call it the ‘Group Of Death.’ I think there was more than one ‘Group Of Death’ for this World Cup. It’s a wonder why Group B didn’t get that label. -Spain (1)- Now seems to be ‘The Reign of Spain.’ Spain has always been known to be full of football talent but the team hardly ever came together at World Cup tournaments of the past, often performing below people’s expectations. This would cause Spain to be known as ‘football’s greatest underachievers’ for a long period of time. This all changed when Vicente del Bosque was appointed coach of Spain’s national team in 2008. Since then, Spain’s magic came about. It all started with winning Euro 2008, then surprising everybody including their compatriots with a win of the 2010 World Cup. Spain’s long-awaited legacy continued with a win at Euro 2012 and becoming the first team ever to successfully defend their European Championship. Spain’s success continued as they played without a loss until the finals of the Confederations Cup where they lost to Brazil 3-0. Spain continues to be brilliant only losing one game since, 1-0 to South Africa. Spain just recently beat Italy 1-0 in a friendly. They appear poised to repeat in Brazil. It’s the next month that will define things. -Netherlands (15)- While Spain is no longer ‘football’s greatest underachievers,’ the Netherlands have the misfortune of being seen as the greatest team in the world to never have won a World Cup. Three times a finalist, never a winner. Oranje is waiting for that day to prove themselves the best in the world. However it will come a t a challenge. Back during Euro 2012, the Netherlands performed one of the biggest chokes in their history by losing all three of their Group Stage matches. 2013 was a year they really wanted to make up for things and they did well by not losing a game. However failing to win all four of their friendlies since World Cup qualifying including a 2-0 loss to France shows that they might not be ready for this World Cup. This is unfortunate for head coach Louis van Gaal as he would like to leave team Netherlands on a positive note. Nevertheless it could be that Oranje is just ‘playing possum’ and may come alive in Brazil. -Chile (13)- Chile is another team full of talent that has yet to prove itself in a big way. The team that is affectionately called ‘La Roja’ by its compatriots and supporters have only gone as far as 3rd at the World Cup, and that was back in 1962 when they hosted it. In recent years, Chile has been better at its consistency. They’ve qualified for the 1998 and 2010 World Cups and finished in the Round of 16, the only other two times they’ve made it past the Group Stage. Chile has had a great play record since 2013 in both friendlies and World Cup qualifiers. They’ve shown they can challenge some the best teams in the world, if not defeat them. They beat Uruguay 2-0 in a World Cup qualifier last March, tied Spain 2-2 in a September friendly and even beat England 2-0 in a friendly in November. However they have lost to Brazil 2-1 back in November and lost to Germany 1-0 this March. Most people are predicting Spain and Netherlands to be the two advancers from Group B. There could be a Chilean surprise. -Australia (59)- The Socceroos were the surprise of the 2006 World Cup. Their 2006 advance to the Round of 16 led them to be transferred from Oceania’s continental federation to Asia’s. However their prowess has taken a bit of a dip. They didn’t advance past the Group stage in 2010 and have struggled in play for the Asian Cup. The 2013 and 2014 play seasons have been unimpressive including 6-0 losses in friendlies against both Brazil and France. In 2014, they’ve had a 4-3 loss to Ecuador and a 1-1 draw to South Africa. 2014 could be a further learning experience for Australia. So now my prediction for the two advancers from Group B: Spain will definitely advance but it will be tight between Netherlands and Chile in which I feel Chile will be the one moving on. There’s been a lot of concern of the readiness of many of the stadia set to stage the World Cup. 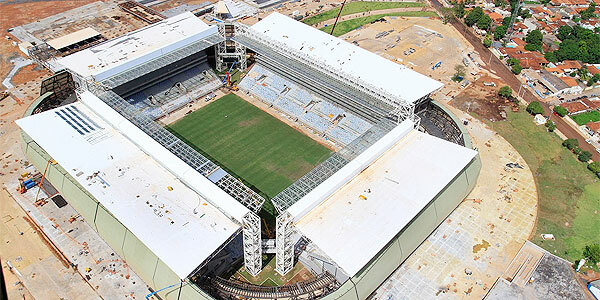 Cuiaba is one stadium that’s been causing some of the headaches. One of the headaches happened back in October when a fire caused structural damage, which has since been repaired. In fact Cuiaba needed a second World Cup warm-up match on April 28th to prove its readiness. FIFA was pleased this time around. Nevertheless it didn’t guarantee the stadium was 100% ready. Work returned to the stadium shortly after and on May 9th, a worker was killed when he was electrocuted while working on the installation of a telecommunications network. Work was halted temporarily after his death. 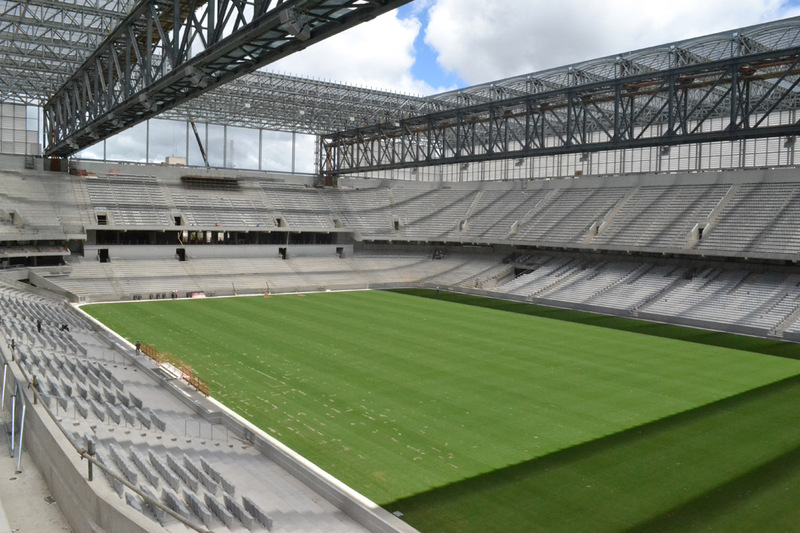 Ready or not, Arena Pantanal will be the stage for four Group Stage games. After the World Cup, the Arena is to be reduced in capacity and to be the home venue for both Cuiaba and Mixto Esporte Club. Not all World Cup stadium problems are about the new stadiums. Existing stadiums have had their own problems too in terms of renovations or upgrades. Curitiba’s Arena da Baixaba is one stadium that had its issues. The stadium had plans for upgrades like extra seats and a retractable roof. The stadium suffered a setback in October 2013 as work was suspended on the orders of a Brazilian labor tribunal due to numerous and serious safety breaches. An extra headache came in January 22 of this year when FIFA’s General Secretary visited the Arena and said Curitiba could be dropped if significant improvements in the renovations didn’t take place within a month. FIFA decided to keep Curitiba the following month. Recently there was some good news about the Arena. Valcke visited the Arena again on May 22nd and this time he praised it for being a ‘top-class’ venue. The venue is expected to have its seating reduced once again to its usual 30,000 and return to being the host venue for Atletico Paranaense.